If you’re studying for a GCSE in Psychology you’ll need a revision guide that tells you everything you need to know. This accessible and interactive book covers all compulsory and all optional topics on the GCSE Edexcel Psychology syllabus introduced in 2017, including development, memory, psychological problems, brain and neuropsychology, social influence and research methods. It summarises the specification material clearly and attractively, enabling you to easily digest and retain the information ready for your exams. Perfect for revising psychological concepts, theories and studies in relation to the three critical assessment objectives, Psychology GCSE Revision Guide for Edexcel is an essential resource for anyone taking a psychology GCSE using the Edexcel specification. 'This revision guide is an excellent supplementary resource for our students. It clearly explains and demonstrates the key content and exam skills required for success. The summary tables and key study content are easily accessible and retainable by students. The interactive, structured format of the revision guide allows students to demonstrate their learning at each key point and the extensive practice exam questions at the end of each section provide invaluable practice. 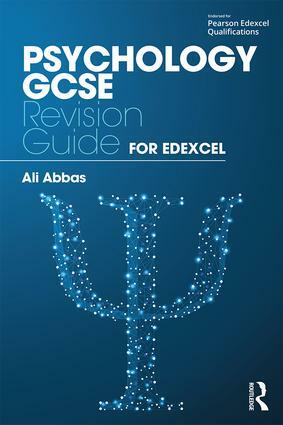 This revision guide is a key tool in our delivery of the GCSE and I would highly recommend it to both students, and teachers alike.' - Sharon Hedger, Head of Psychology, De Lisle College, UK. 1: Development – How did you develop? 2: Memory – How does your memory work? 3: Psychological problems – How would psychological problems affect you? 4: The brain and neuropsychology – How does your brain affect you? 5: Social influence – How do others affect you? 6: Criminal psychology – Why do people become criminals? 7: The self – What makes you who you are? 8: Perception – How do you interpret the world around you? 9: Sleep and dreaming – Why do you need to sleep and dream? 10: Language, thought and communication – How do you communicate with others? 11: Research methods – How do you carry out psychological research? Ali Abbas has 13 years’ experience working as a Principal Examiner, which has included responsibility for writing A Level exam papers for Edexcel, and nearly 20 years' teaching experience for the major exam boards at A level and GCSE. He has been providing training and support to staff and students since 2003 and regularly visits numerous schools and colleges nationally and internationally. Ali has been a Fellow of the Chartered Institute of Educational Assessors (FCIEA) since 2008.